On the occasion was present Union Road Transport and Highway minister Nitin Gadkari who advocated the use of IT in improving the logistical facilities in India. “We are monitoring 900 projects worth Rs 6 lakh crore. 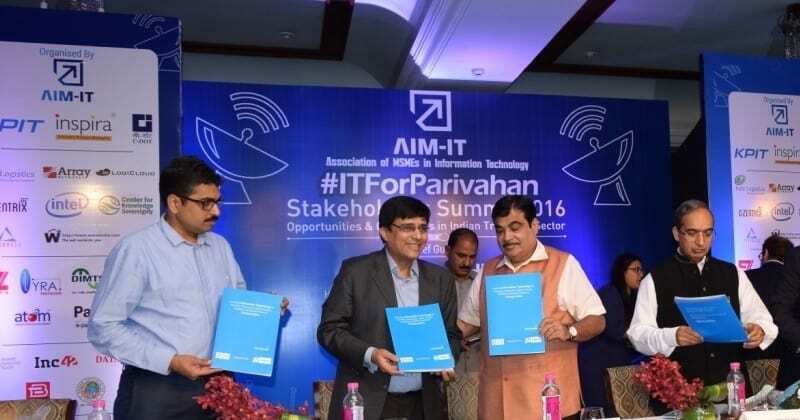 By monitoring , we can increase efficiency ” said Gadkari, at the launch of IT for Parivahan campaign. “There are a few problems related to 21 projects that are valued at Rs 30,000 crore, but we will very soon resolve them. When our government took over, the length of national highways was barely 96,000 km of the overall length of roads which was 52 lakh km,” added Gadkari. Sushil Kumar, Dy. Director General (IoT) talked about smart cities and shared his views on how machine-to-machine (M2M) communication. According to him, IoT can help in making cities smarter and turn transportation smarter. AIM-IT aims to infuse IT into parivahan and making it digital. NHIDC (National highway infrastructure development corporation limited) Director Sanjay Jaju announced the launch of three projects this coming 16th May. The launch event saw participation from various stakeholders including central and state ministers, bureaucrats, start-ups innovators and policy makers. Discussions were held on varied topics such as, the future of smart shipping and smart road networks, “Start up India”, enabling efficient logistics and smart roads. The best part of this campaign was that it received an immense response across varied segments such as common citizens and IT sector. Use of IT, a must for better transportation, says Nitin Gadkari 5 out of 5 based on 1 ratings. 1 user reviews.